The list of implied organizations is a list of organizations that have not physically appeared up in any form of media to this point in time. Regardless of their lack of appearance, implied organizations have been mentioned at least once throughout the Mario franchise. Beanbean Air is an unseen line of aircraft in Mario & Luigi: Superstar Saga. The planes fly from the Beanbean Kingdom's airport to a Mushroom Kingdom airport (and possibly other destinations as well). A Beanish lady says that Chuckola Cola is prohibited onboard Beanbean Air. Boyz II Pumpkins is a contemporary band mentioned by Frogfucius in the Super Mario RPG: Legend of the Seven Stars Nintendo Player's Guide. Frogfucius cites the band as an example of the poor music being produced in the contemporary era, compared to the music he grew up with as a child. He states: "When I was a wee tadpole, we had real music. None of this Boyz II Pumpkins nonsense." The name Boyz II Pumpkins is a combination of two real world recording groups, both popular in the 1990s: Boyz II Men, an R&B group, and The Smashing Pumpkins, an alternative rock group. Indeed, Frogfucius, as a stereotypical "elderly person," may simply be confusing each group as the same band, producing the name "Boyz II Pumpkins." The Brooklyn Dodgers is a fictional Brooklyn baseball team coached by Tommy Lasagna. It was mentioned during The Super Mario Bros. Super Show! live-action segment "Two Bums from Brooklyn". The team is named for after the non-fictional team of the same name. Decades before The Super Mario Bros. Super Show! began airing, the real Brooklyn Dodgers relocated to Los Angeles, where they became the Los Angeles Dodgers. Mario and Luigi hoped Mr. Lasagna would recruit them for the team. Unimpressed with both their skills and their cooking, Mr. Lasagna decided to bring their meatballs back for his team to practice with in lieu of actual baseballs, and offered them jobs tossing peanuts at ballgames. The Brooklyn Plumbing School is a school at which at which Mario and Luigi were members of the band for three years. The band is called the Brooklyn Plumbing School Band. The only mention of these organizations was by Mario and Luigi during The Super Mario Bros. Super Show! animated episode "The Pied Koopa". During the episode, Toad asks the brothers if they can play the instruments they had created out of Bowser's Castle's plumbing. Luigi responded that they had been in the band. Mario commented that they were thrown out for eating during a concert. Luigi maintains that he was not, but had simply held Mario's salami sandwich while his brother turned the page. Because of this, it can be inferred know they sat in close proximity. Mario had made a trumpet while Luigi created a trombone, two instruments that are classically situated nearby one another. The Chippie Chipmunks are a group of people who are dedicated to performing good deeds towards others. It was mentioned during The Super Mario Bros. Super Show! live-action segment "Chippie Chipmunks". Mr. Gibbel is known to be a high-ranking member. Members such as Mr. Gibbel wear a brown costume with a chipmunk emblem on the front with a matching chipmunk hat, and greet other Chipmunks in a chipmunk-like manner. The Chippie Chipmunks have a contest every month to see which member is worthy of becoming Chipmunk of the Month through performing enough good deeds. The winner is evaluated on a points system, and receive a Secret Chippie Decoder Ring at a special awards ceremony roughly one week after winning. The Fawful Foundation is a company owned by Fawful. Not much is known about this company other than the secret tunnel in Bowser Castle was bought out by it. Additionally, The Monty Bros. became elite employees of the company after switching sides. FM Shroom is a Mushroom Kingdom radio station. Its DJ is DJ Toad, as mentioned in his message on the back of the Toad Town message board in Paper Mario. FM Shroom is a pun on 103.7 Kiss FM (now 107.5 WBLS), a real life radio station in New York City. Goldbobbington's is a large corporation that Goldbob the Bob-omb owns. It was mentioned during Paper Mario: The Thousand-Year Door. Not much is known about this corporation, only that it is a wealthy organization. If Mario speaks to Goldbob's wife Sylvia at some point during Chapter 3, she erroneously refers to the corporation as "Golbobbington's" (spelled without the D). The Grand Order of Plumbers is an organization dedicated to plumbing from The Super Mario Bros. Super Show!. The only mentioning of the Grand Order of Plumbers was in The Super Mario Bros. Super Show! live-action segment "Plumbers of the Year", in which the Grand Order of Plumbers sent the Imperial Poobah to grant Mario and Luigi the status of Plumbers of the Year. Hafta Havit Hairdryer Hotline Corp, or HHHHC, is a mail-order company, presumably headquartered on Earth, mentioned in Mario is Missing!. Little is known about them apart from the fact that they sell hairdryers. Bowser ordered many hairdryers from them in his campaign to melt the Earth's polar ice caps. As a result, their stock went through the roof, and they were rather angry that Luigi put a stop to the Koopa King's scheme. Their name is a pun on "have to have it." The Kingdom News Network (KNN) is presumably a news station that broadcasts in the Mushroom Kingdom. The Lakitu Bros. work as eyewitness reporters for this network, as revealed in the Super Mario 64 Nintendo Players' Guide. The game itself also mentions that they work for a news station, though it goes unnamed in game. Lakitu travel is an implied travel organization that is depicted in Mario & Luigi: Partners in Time. It is seen in the Star Shrine, when Mario and Luigi gain the fourth Cobalt Star Shard. Kylie Koopa and Toadbert come flying by on a Fishin' Lakitu's pole; the Lakitu then drops them off and says, "Thank you very much for choosing Lakitu travel. Have a nice day!" Then, it flies off. The Luigi Fan Club is, as the name suggests, a fan club for Mario's brother, Luigi mentioned in Paper Mario: The Thousand-Year Door. There are only two known members of this fan club, Toadia (from Poshley Heights), the secretary, and an unnamed Toad from Petalburg, the leader. These two characters provide the only mentions of the club. Several other characters in the game also state their favoritism of Luigi, especially in Petalburg. The secretary ironically mistook Mario for Luigi because Mario was wearing a green hat and shirt. When she met the real Luigi, she called him a fake. The Missing Bird Bureau is an organization briefly mentioned in The Super Mario Bros. Super Show! episode "The Bird! The Bird!". Judging from its name, it can be surmised that the Missing Bird Bureau is employed by individuals to search for missing birds, as evidenced by a Birdo using it to find her missing child, Cheepy. The Mushroom Wrestling Federation is an organization that hosts wrestling matches in the Mushroom Kingdom. 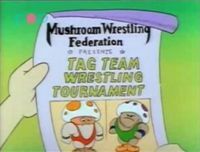 The Mushroom Wrestling Federation was only ever mentioned in The Adventures of Super Mario Bros. 3 episode "Tag Team Trouble". In the episode, they were hosting a Tag Team Wrestling Tournament, which had a one-million Gold Coin grand prize. The only known employee of the federation is the Mushroom Referee. The Pidgit Express is an organization briefly mentioned in The Super Mario Bros. Super Show! episode "Mario's Magic Carpet". Little is known of the Pidgit Express, though its possible it is a mercenary group, as King Koopa, through a phone call, hires a dozen Pidgits to attack Mario, Luigi, Toad and the genie's flying carpet through it. However, only nine Pidgits come, though it is still said that it is a pack of twelve. The name may have been a play on the defunct low-cost airline People Express. The Rogueport Restoration Committee is an organization spoken of in Paper Mario: The Thousand-Year Door. The Committee is responsible for the publication of every issue of the Rogueport Direct Mail Service. Sigil Securities is a global company in Wario: Master of Disguise. Carpaccio, who mention Sigil Securities several times, is the head of it. It is known that Carpaccio used the financial might of this company to develop a morphing technology that helped him become Head Honcho Carpaccio. Carpaccio says that the slogan of the company is, "We're hard at work watching your back... that way it's easier to pick your pocket." For the episode, see Slime Busters. Slime Busters is an organization comprised of members who specialize in ridding residencies of Slime Ghosts. In the live-action segment of The Super Mario Bros. Super Show, in the episode Slime Busters, Mario Bros. Plumbing contacted the Slime Busters to take care of a Slime Ghost infestation. The Slime Busters sent Ernie Hudson, who was famous for playing Winston Zeddemore in both Ghostbusters films, to fix their issue. The Slime Busters' name is a reference to the Ghostbusters, a fictional organization made famous by its self-titled films that handled problems with ghosts. The Snowtown Ice Stars is a baseball team. Mr. Blizzard pitches for them, and won 21 games for them. They regularly play at the Ice Stadium. The Sticky Wiki is a wiki most likely created by Toads in the game Paper Mario: Sticker Star. It provides often humorous information on the Things displayed at the Sticker Museum (i.e. poking the D-Cell Battery with a stick several times to release the energy inside). The Sweaty Palm Martial Arts Academy is a combat training school referred to by the Sammer Guys Slipping Grip, Clammy Hand, and Forbidden Slap. Forbidden Slap is stated to have been the top student until his expulsion for studying "forbidden slapping techniques", while Slipping Grip is stated to be the second best student. Slipping Grip and Clammy hand convince Forbidden Slap to re-enroll in the academy after his defeat, certain they will take him back. However, if the Duel of 100 is replayed after the game's completion, Forbidden Slap still speaks of expulsion, leaving it unknown if the academy allowed him to return. The Sweaty Palms academy and its students' names may be a cultural joke based on early reports that Wii players would get sweaty hands while playing, lose the grip on their remote and subsequently throw it into their television, furniture or other players. The Nintendo News is the name of the company who makes newspapers which Wario reads the begging of Wario Land 4. Only one issue is seen with the discovery of the Golden Pyramid on the front cover. Note that the name "The Nintendo News" is not actually visible during normal gameplay, but it is part of the newspaper sprite. The Toadwood District Rangers are forest rangers at Toadwood Forest. A sign written by them instructs how to use the Piggyback Jump. The University of Goom (also known as U Goom) is a university mentioned in Paper Mario: The Thousand-Year Door. Goombella attended this college at some unknown time prior to her adventures with Mario in and around Rogueport. Her teacher was Professor Frankly, who was doing research in Rogueport during the events of the game. The exact location of U Goom is unknown. Kolorado, the Koopa archaeologist from Paper Mario, was also one of Professor Frankly's students. As such, it is likely (although not confirmed) that Kolorado attended U Goom. This would also imply that the university was not strictly a school for Goombas. Goombella's statements towards the beginning of Paper Mario: The Thousand-Year Door imply that she had only recently arrived in Rogueport, seemingly confirming that U Goom is not located in the rogue-filled city. However, Goombella actually describes herself as "a student in Rogueport" on the official Paper Mario: The Thousand-Year Door website, suggesting that she had not yet graduated and that the University of Goom is located in Rogueport, or that U Goom has off-campus classes in Rogueport. Kuriforunia Daigaku Kurifornia University (pun on "California" and "Kuribō", the Japanese name of the Goombas). French Université de la Goomorbonne Pun on Goomba and Sorbonne, the oldest university in Paris. WIN-tendo is a company that seemingly makes video games, named in Mario & Luigi: Superstar Saga. When playing the arcade game Star 'Stache Smash in Little Fungitown and viewing the controls, "© WIN-tendo" can be seen in the bottom left corner. The name is a portmanteau of "win" and "Nintendo." The Yoshi Fan Club is a club made by Boddle, a big Yoshi fan in the game Mario & Luigi: Superstar Saga. Because the club is only mentioned in the game, it is unknown what the club does but they have their own theater, named the Yoshi Theater, where many Yoshis gather. It is possibly made up of many Yoshis and some Beanish people. A Beanish person in this club helped Mario and Luigi with finding Neon Eggs. This page was last edited on January 1, 2019, at 15:57.